There are only a few minor news items to report today after all of the excitement of the Sengoku Basara 4 DLC costumes last week. Hopefully we'll get some new character announcements in Weekly Famitsu in a few days, though this week Dengeki Playstation is coming out on Thursday as well which might ruin the alternating pattern the two magazines had fallen into. I don't usually translate content from the newsletters but the amount in this one is so lean that I feel slightly disappointed about how much I paid to get it - so why not? You can see snapshots on this Japanese fan's blog to go with game director Yamamoto Makoto's annotations which I've attempted to transcribe below. Everything in the newsletter is a repeat of existing information other than these tiny comments. Date Masamune: Masamune is reflected in Katsuie's eye. Shibata Katsuie: Katsuie reflected in Masamune's eye. Ishida Mitsunari: The theme of this battle is 'katana and teeth'. Ii Naotora: Naotora has also studied karate! Yamanaka Shikanosuke: A temporary loan. Sanada Yukimura: The wager is the six coins!? Tokugawa Ieyasu: Tadakatsu isn't working properly. Toyotomi Hideyoshi: Split into four. Oda Nobunaga: Bang bang! Bullets rush forth. Akechi Mitsuhide: Azuchi Castle. Hellish voices cry out in agony. Ashikaga Yoshiteru: Turning. The era is turning. 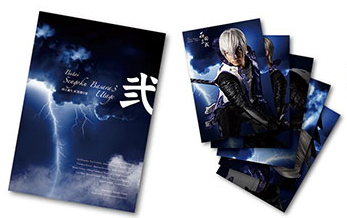 With just a week left until the new Butai Sengoku Basara 3 Utage Two: Kyouou Tanjou x Shinen No Utage ('The Birth Of The Dark King x Feast Of The Abyss') stage play debuts, the exclusive merchandise fans can buy at the event has been revealed. The show's official pamphlet (¥2,000) and a choice of seventeen five-piece sets of photographs (¥1,000). A mutsugiri photograph (¥1,000). 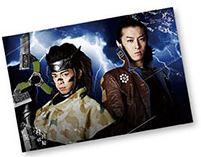 There are three different A4 designs to collect: Mitsunari/Hideyoshi, Kojuurou/Sasuke and Hanbee/Motonari. T-shirt in S/M/L sizes (¥2,500), two types of A4 clear file (¥600) and three sets of hand towels (¥1,500). 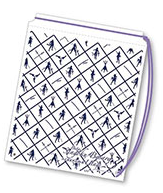 Each hand towel set contains two designs with a choice of Mitsunari/Hanbee, Masamune/Yukimura or Kojuurou/Sasuke. Plastic shopping bag (¥500). If you look really hard it's possible to make out silhouettes and weapons for Masamune, Yukimura, Mitsunari, Sasuke and Kojuurou. The one piece of interesting information from last week's Weekly Famitsu magazine is that the game has risen again in the magazine's charts and is now sitting in 8th place. Nine Demons Yoshitaka and PSandNintendFreak from the Koei Warriors forums have created a translation of the game's third official promotional video for their fellow fans. There are translated versions of all of the other official videos on the same channel. If you've been holding back on preordering the Sengoku Basara 4 Hyakka Ryouran Tamatebako limited edition, I recommend placing your order soon. Japanese shops have started to sell out of their allocations with both Bic Camera and Tsutaya suspending online reservations in the last few days. Edion is also sold out, though I'm not sure if that's a temporary status since I've never shopped with them. Update 29/10/2013: Thanks to commenter momotu it seems that Edion's order page now includes a special Mitsunari video. Many Japanese games receive a cheaper Asian edition intended for distribution in countries such as Taiwan and Hong Kong, and accordingly listings have now appeared for Sengoku Basara 4. The differences are usually minor - there probably won't be any extras with the Asian edition and if there's a character ranking with the new game you probably won't receive a voting card, but in return the price is usually lower and you might receive a translated instruction sheet. The game disc itself is usually identical and your money still goes straight back to Capcom. I'll be sticking with the Japanese edition and all of the bonus features (especially as I won't benefit from having the instructions translated into Chinese). For the benefit of those on a tighter budget I've spotted listings for the Asian edition on Yesasia (US listing) and Play-Asia so far. The Amazon link is here; unfortunately there doesn't seem to be any way to embed the video. Edion open the online reservation for Ishida's version now, along with the video promote for his DLC.